Descend to the bottom using the slide! 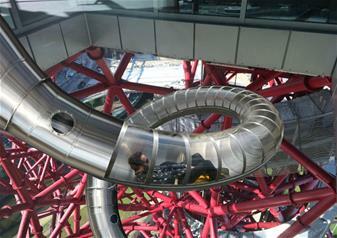 76 metres high and 178 metres long, the slide has windowed sections for you to peek out! Experience the newest and most exciting thing to arrive in London this year, the world’s longest and tallest tunnel slide at the ArcelorMittal Orbit! Before you take your ride on the slide, enjoy the views from the top of the ArcelorMittal Orbit in Stratford, the UK’s tallest sculpture at 114.5 metres tall. With panoramic sights that span up to 20 miles, enjoy uninterrupted views of London sights such as Canary Wharf, the arch of Wembley Stadium, the O2 Arena, Alexandra Palace, The Gherkin, St Paul’s Cathedral, The Shard and The Walkie Talkie. When you’ve finished taking in the views, descend to the bottom in the most unique way possible, the slide! Created by Belgian artist Carsten Höller, the slide is 76 metres high and 178 metres long. It twists and turns an impressive 12 times and includes a tight corkscrew named the ‘bettfeder’ – the German word for ‘bedspring’. Travelling at up to 15 miles per hour and lasting for an exhilarating 40 seconds, the slide finishes with a 50 metre straight run to the ground and certain sections have ‘polycarbonate ‘windows’ for you to catch the view on the way down!